Four ski resorts make up the Niseko ski area, all are interconnected and can be accessed from the top lifts. 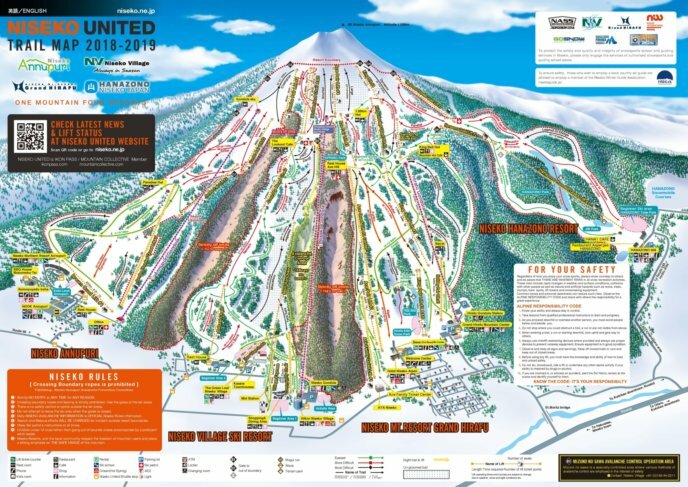 An All Mountain Lift Pass will allow you to travel between them all and explore all that Niseko has to offer. Night Skiing is offered in many ski resorts world-wide but Niseko is the world’s largest area offering up to 4 hours skiing time every night. As the sun goes down and most skiers and riders go home, there is a group of enthusiasts who are gearing up ready to take on the slopes under the moon-light. Niseko offers night skiing until the end of March. All lift passes include night skiing or you can purchase just a night skiing ticket. Complete with one of the best terrain parks in and around Niseko, Hanazono is definitely a place to check out. With 3 chair lifts that link up to get you to the up the mountain, you will enjoy the endless array of jumps, tree runs and long wide runs. There is a FREE shuttle bus that runs from various locations around the village. The first shuttle will get you there 10mins before the lifts open at 9.00am. The Stomping Ground at Hanazono is the premier park in Niseko with jumps designed to cater for every ability whether you are a beginner or advanced skier/boarder. Hanazono also houses the only FIS approved half pipe in Hokkaido. Grand Hirafu is the main ski area. With over 10 chair lifts and the new and improved Grand Hirafu Gondola, getting up on the mountain has never been easier. There is a vast variety of tracks and runs that will not only be challenging but will also help improve your ability. Whether you like to stay on the groomed or try your luck at dogging trees, Grand Hirafu can cater for all. Also, when hunger strikes and you’re feeling the aches of your muscles, there are 7 restaurants and shops that you can pull up to and relax while getting something to eat. Hirafu’s terrain park is located next to King Pair #1 and opens at 10am each day. There are usually a few jumps and half way through the season a small half pipe might be accessible. However it’s not until spring skiing when it truly becomes a full terrain park with big jumps, a spine, rails and boxes to play on. Niseko Village is located between Annupuri and Grand Hirafu and is home to the Hilton and Green Leaf Hotel. The most adventurous of skiers and riders take on the terrain and make their way up to the peak for a glimpse of the Pacific Ocean and utilise the wide open run on the way back down. Niseko Village Wonderland Terrain Park is open from the beginning of March with rails, spines, waves and hits for all abilities. Annupuri is home to a great selection of wide smooth runs that any skier or riders love to take advantage of. The normal runs are also complemented with a natural terrain park going through the trees making great runs every time. Annupuri is not a recognised terrain park but while some riders will stick to the few rails and jumps across the resort others like to tackle the natural park out in the back country. If you have any questions about your next ski holiday, Niseko, Japan or would just like to have chat please don't hesitate to contact us.